I am a friend of Gerry and Kate, I used to work for them and also looked after the children. I got to know Gerry and Kate in the year 2000, I worked as a cleaner in their house in Queniborough, once a week. From the beginning they were always a very friendly couple. During the time I worked there, Kate had her first daughter, Madeleine. Kate asked me whether I would look after Madeleine twice a week when she returned to work part time. I agreed and she would leave Madeleine at my house and come and pick her up later in the day. Kate, Gerry and Madeleine moved to Amsterdam for a year and when they returned Kate was pregnant with the twins. The twins were born in February 2006 and from that time I helped to look after them. The relationship I had with Gerry and Kate turned into friendship over the years and I consider myself to be a good friend of Kate's. After their return from Portugal we became very close. Gerry is a person with his feet very firmly placed on the ground, a pleasant person who made us feel welcome from the very beginning. He is very conscientious with regard to his work but also loves his family very much. He adores the children and would often have fun rolling about on the floor with Madeleine. Kate is also a very friendly person, she is calm and serene and also adores the children. I never heard her raise her voice with Madeleine or become irritated with her. 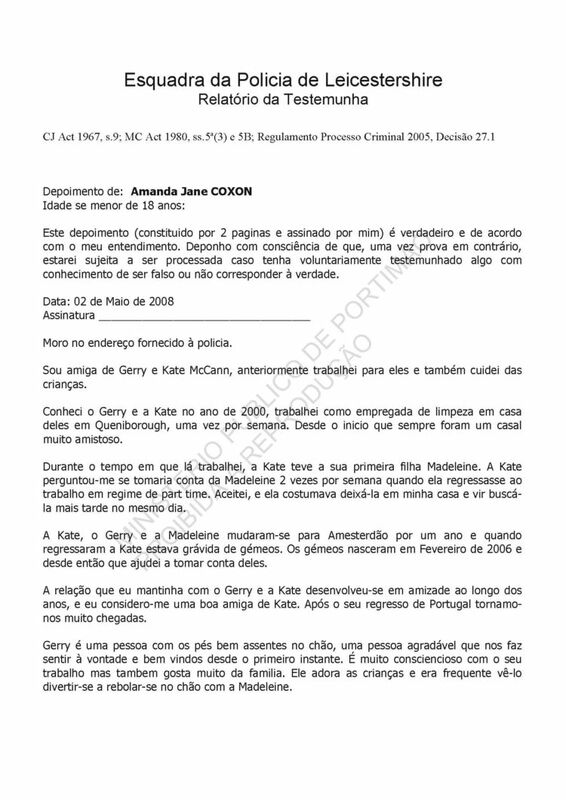 I have no knowledge of any conflict between Kate and Gerry, or between them and Madeleine. I do not know of any problem or conflict between Madeleine and any other person or child. I had a good relationship with Madeleine, I would describe her as full of fun, intelligent for her age and very active. She is a very happy girl and the last time I saw her, she was already capable of maintaining a conversation. She clearly understood the instructions given to her and was a good listener. I would say that Madeleine is a very healthy girl and I never noticed any changes in behaviour. I would not describe her as a hyperactive child. I do not know of any problem related to sleeping, but I was rarely present when she went to bed. Kate and Gerry never mentioned having any type of problem with Madeleine. She was well behaved, never caused her parents any problems and apparently always understood what she was told. The parents never looked tired of taking care of Madeleine. I have no knowledge about whether Madeleine was subject to taking medicine and I never saw anyone giving her any medication. Gerry and Kate never referred to any medication that Madeleine was taking. As I said before, Madeleine was a very well behaved and lively child. With relation to the question about haemorrhages, I was never present at any episode when Madeleine bled, other than a normal nose bleed when she inserted her finger into her nose and bled. Nothing different from any other child having a nose bleed. In my opinion, Kate and Gerry and the children are a happy family who enjoy having fun together. There are no words to describe what happened last year and they do not deserve to have been treated in the way they have been, by the community and by the press. They are two decent and hardworking people who are devoted to their children. This is my statement and is true according to my understanding.